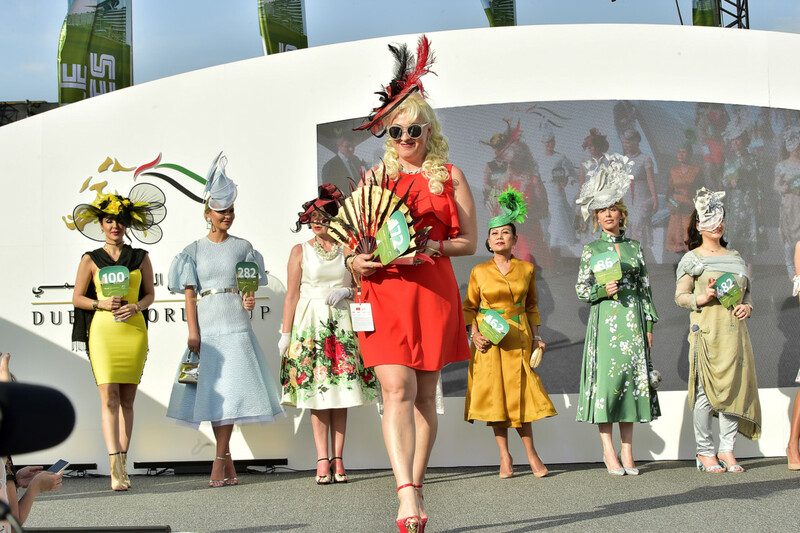 From two 70-something best friends from America winning together, to an emergency nurse nearly missing her big win for a bathroom break, get to know the sharply dressed winners of this year’s Style Stakes on the sidelines of Dubai World Cup on March 30. 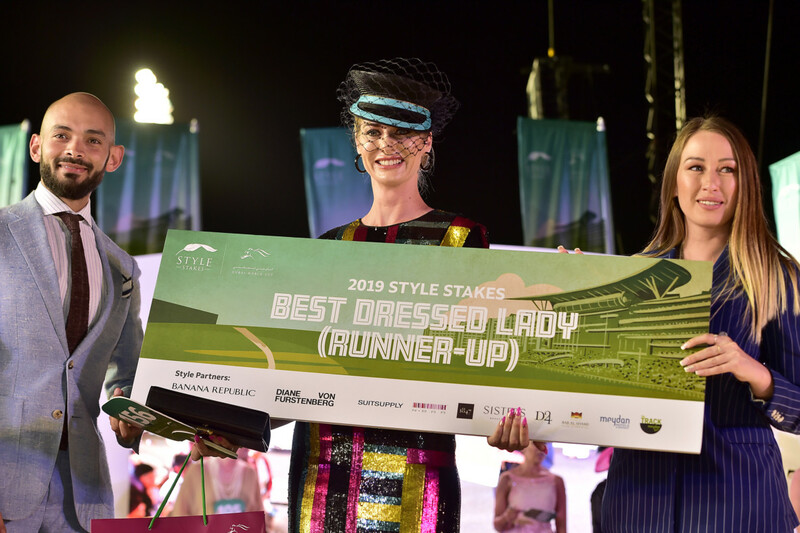 23-year-old Best Dressed Lady Eleanor Campbell was a world away from her day job on Saturday night. Dressed in a powder blue dress by Australian designer Nicola Finetti, the New Zealander is used to taking care of puppies for a living. “Me and my mother own a dog boarding kennel in New Zealand, so this is really fun for us to come and dress up. It’s very different from our job, which involves lots of dogs — we love caring for little dogs,” said Campbell. Campbell flew 17 hours to visit Dubai for the first time. She was left shaking after her win. “I had the dress first and I just loved it. I thought it was a modern colour and it was really cool with the puffy sleeves. I thought it was quite modest and nice. 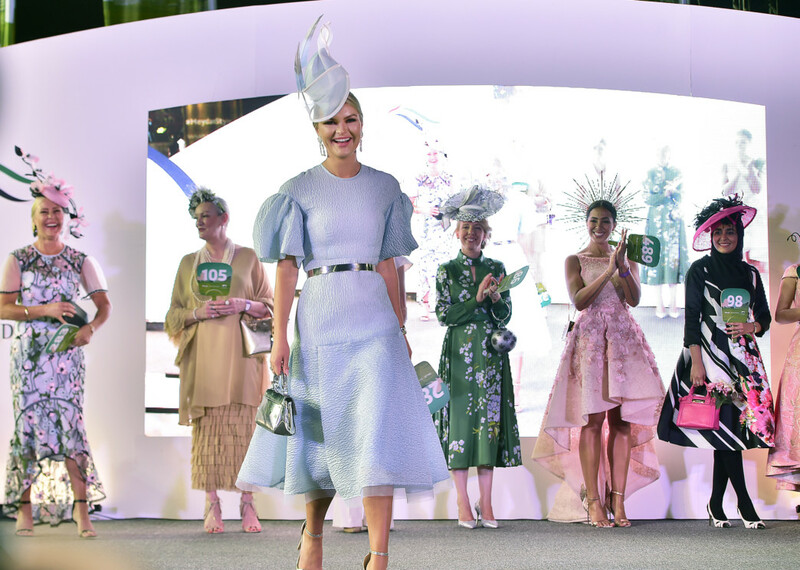 The hat I got made by New Zealand milliner Monika Neuhauser to match the dress, and I wanted to do a cool, modern shape,” said a smiling Campbell. 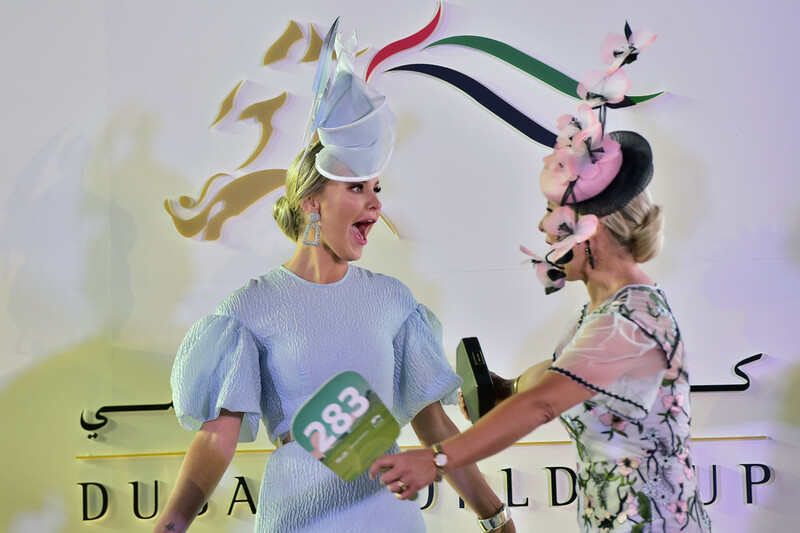 Runner-up Emma Wells, a 36-year-old insurance broker from Australia, also came a long way to be at the races — more precisely, 14 hours. Her bright dress caught the eye of the judges and was a chaotic counterpoint to Wells’ single-colour outfit. “The dress is Diane Von Furstenberg — I just fell in love with the colour and the sequens. I wanted a modern take on elegance, that’s where I was going. 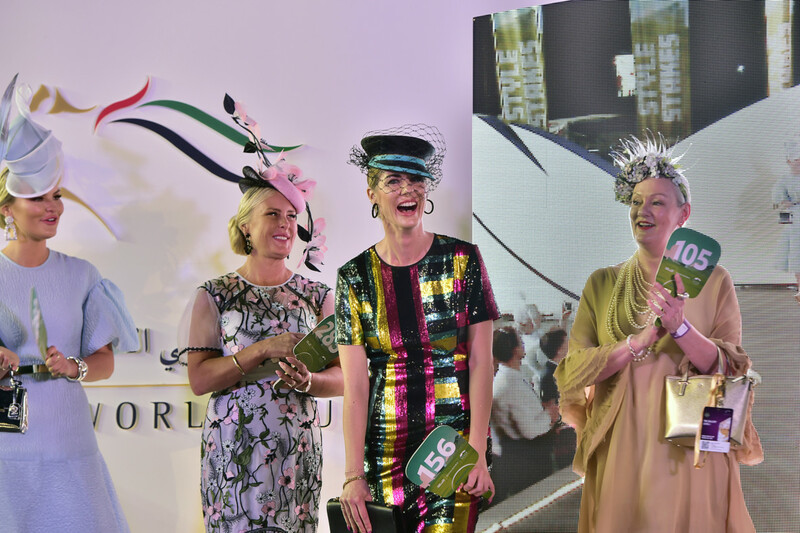 The hat is by an Australian milliner called Sovata; I went to her and I said I wanted something a little modern and quirky, and this is what we came up with,” said Wells, who was on the verge of happy tears after her win. When Corina Tutoui’s paddle number was being called out, the Australian national was nowhere to be seen. 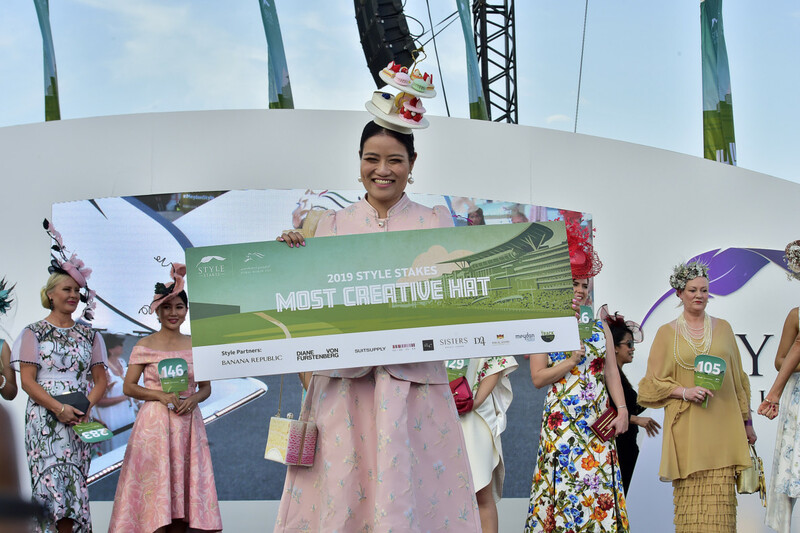 The 44-year-old registered nurse, who works in emergency in Melbourne, nearly missed out on the Best Hat accolade as she rushed back from the bathroom in a panic. “First, I lost my phone in the lounge and I had to go find it, and then I had to use the bathroom. I could hear them calling out ’91, 91!’ and I was like, ‘I have to go, I have to go!’” recalled a breathless and beaming Tutoiu. 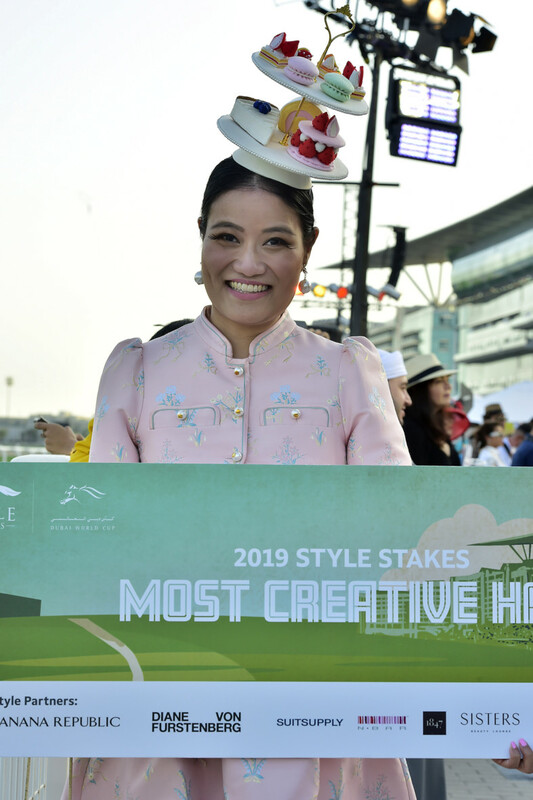 Her winning headpiece was inspired by Lady Gaga, a pop star known for her exaggerated tastes, as well as a Dubai-themed palette of royal blue and camel colours. 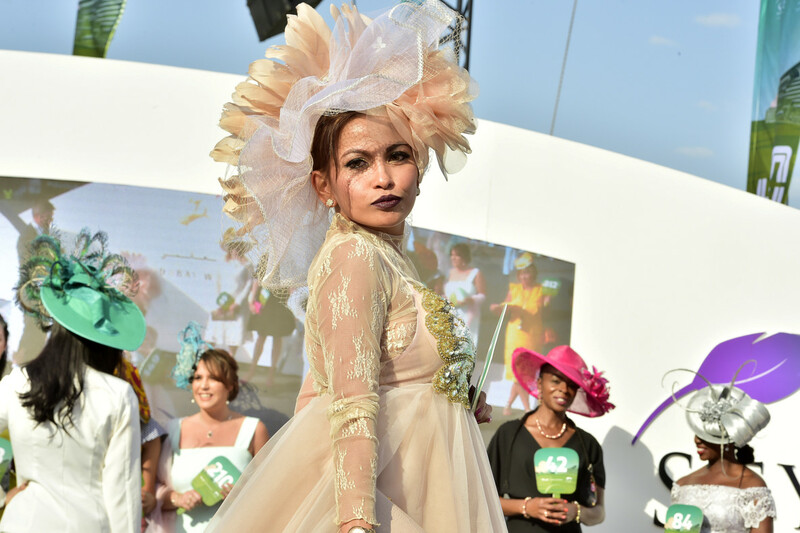 Tutoiu created her dress herself, but teamed up with a nurse-milliner friend to bring her hat to life. 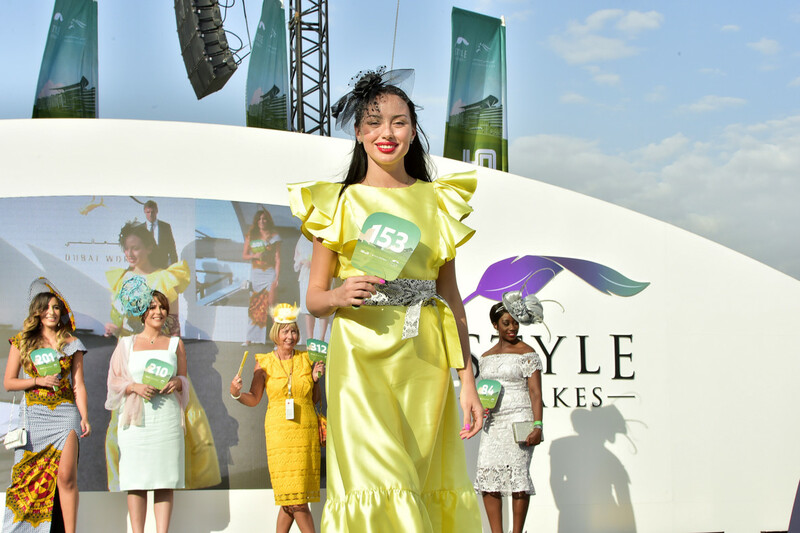 Tutoiu has been coming to the races since 2011 and made it to the Top 20 of the Style Stakes once before. “It was very different eight years ago. It’s improving year by year. 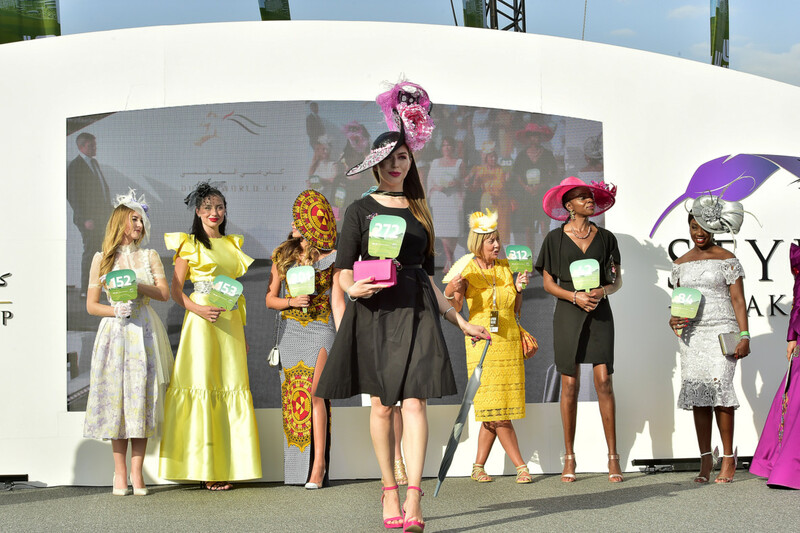 The fashion, the judges — everything is much, much better,” said Tutoiu. 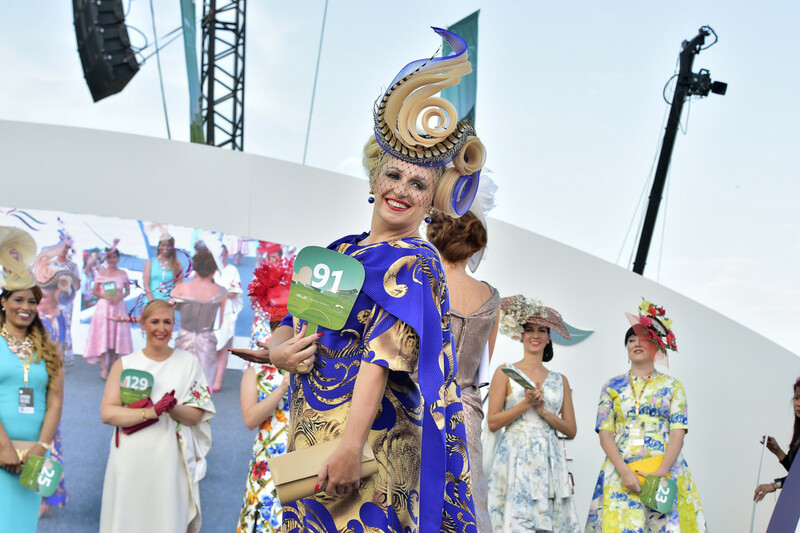 Eksuda Vassakosol had only one person on her mind when she won Most Creative Hat — her 80-year-old grandmother, who had crafted her winning headpiece by hand. 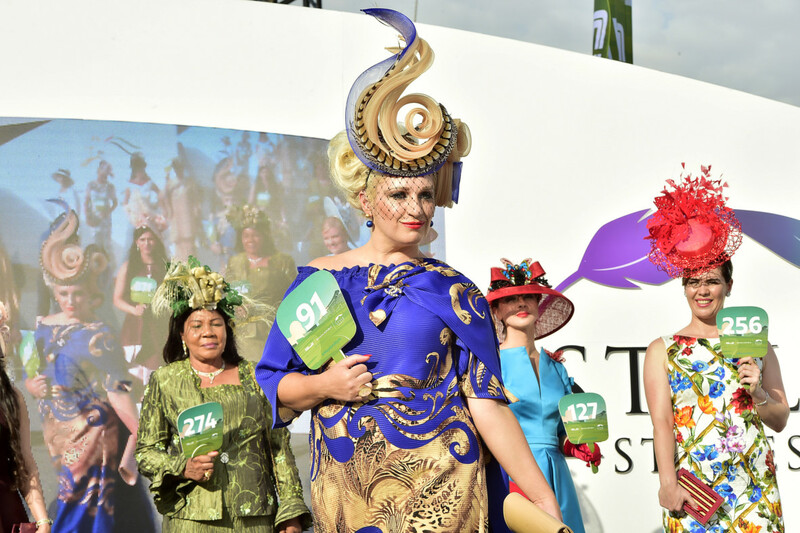 The colourful afternoon tea trays perched on Vassakosol’s head included miniature cakes and macaroons, which were all created lovingly by her grandmother. 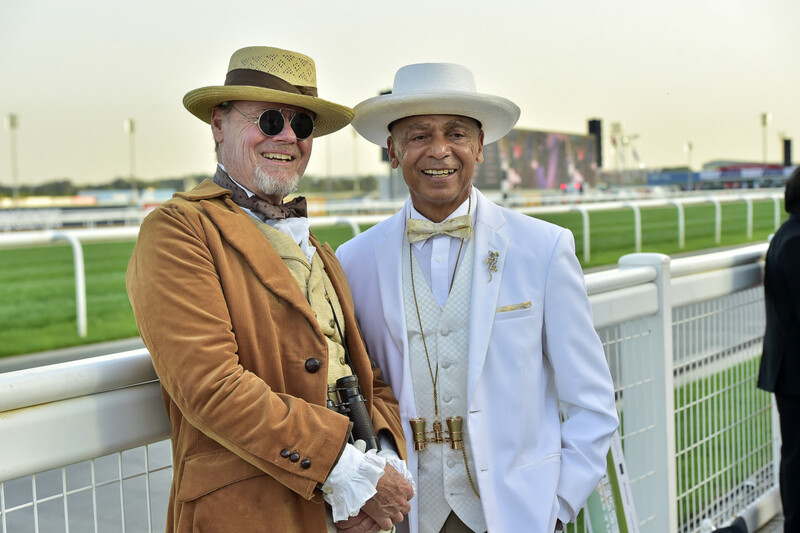 In one of the more memorable moments of the night, American good friends Miles Hamby and Leon Harris, 71 and 72, won first and second place in the Best Dressed Man category. The two have known each other for 20 years — Harris is an Argentine tango dancer, and Hamby was one of his students — and love to throw costume parties back home. “We’ve known each other 20 years. I’m in shock. I’m an older guy, so my attire is very conservative. These colours are my favourite colours — beige and white,” said Harris. The runner-up has been to Dubai 36 times. 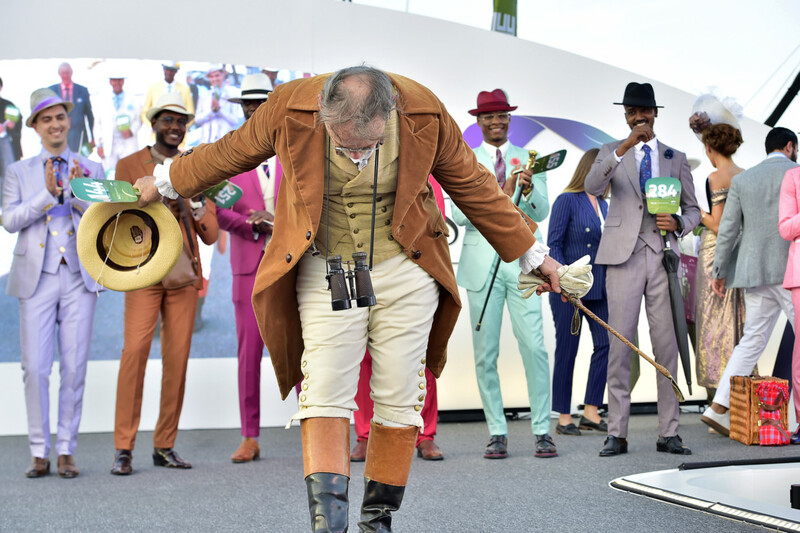 Though he’s competed in the Style Stakes “many times” before, he laughingly recalled the crowd clapping for him in previous years “because I’m a senior citizen,” despite the fact that he had never won before. “Not even runner-up. I can’t believe it. I just can’t believe it,” he said. 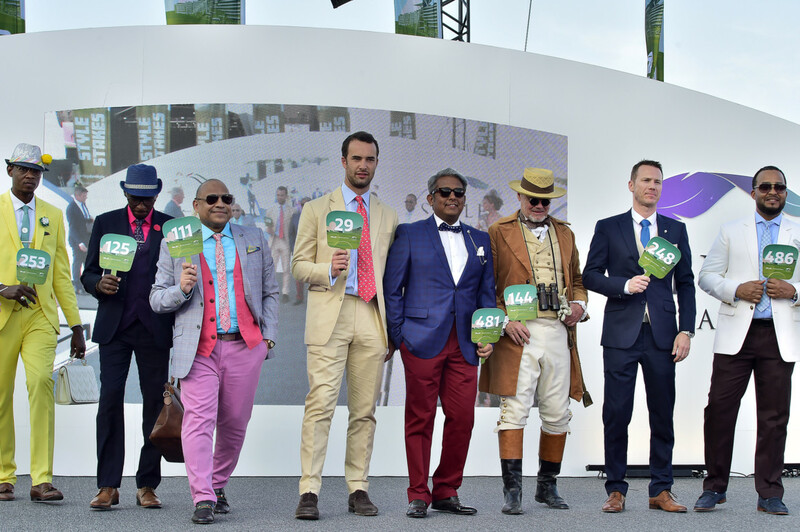 Meanwhile, Hamby won Best Dressed Man on his very first try at the Style Stakes. 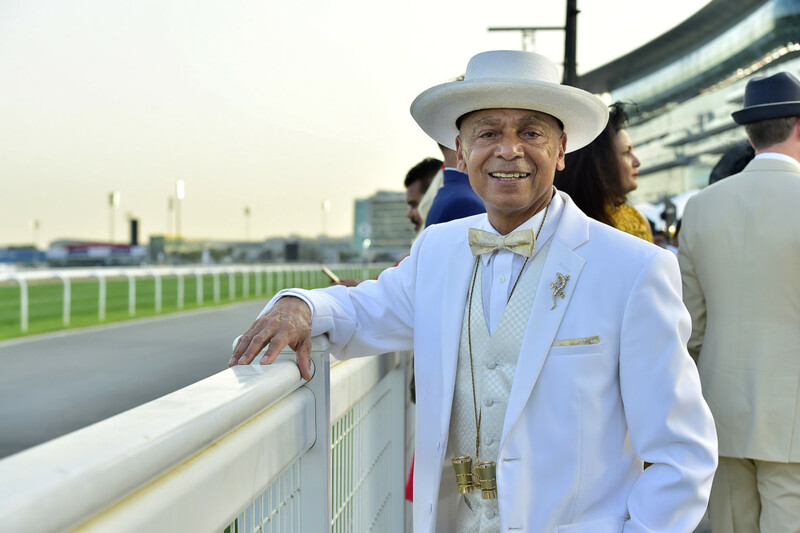 The retired statistics professor living in Alexandria, Virginia looked like a voyager in his outfit, which was inspired by the first Kentucky Derby in the late 1800s. “My family goes back to about 200 years ago in Kentucky. My father was a Kentucky Colonel, my grandfather was a Kentucky Colonel, and I hope to be Kentucky Colonel,” said Hamby, referring to the highest title of honour bestowed by the Commonwealth of Kentucky. 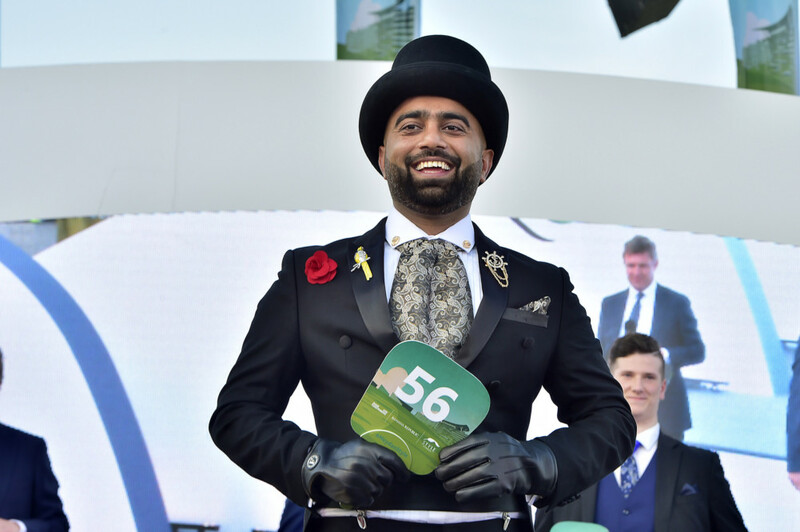 “This is my first time at the World Cup, my first time in Dubai and my first time on the Arabian Peninsula. I did not expect this at all,” admitted Hamby. 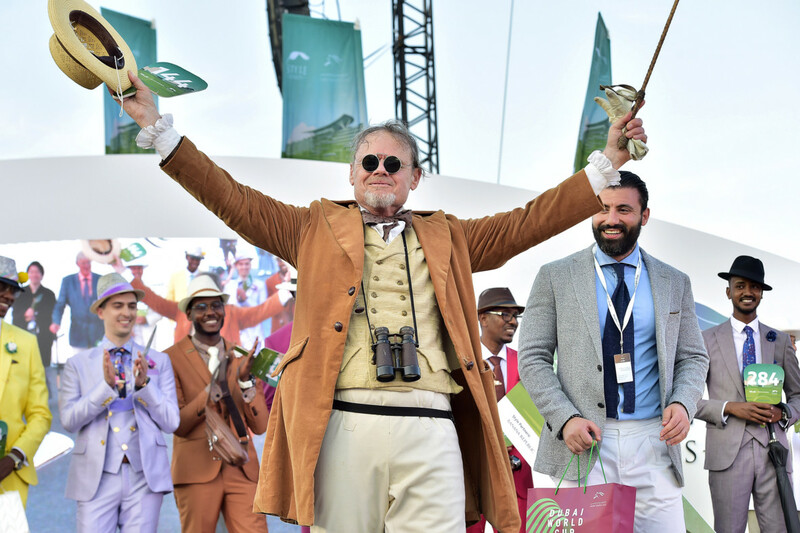 Hamby crossed off climbing Mount Kilimanjaro in Tanzania three years ago whilst in his late 60s, and can now add winning the Style Stakes to his list of impressive achievements. 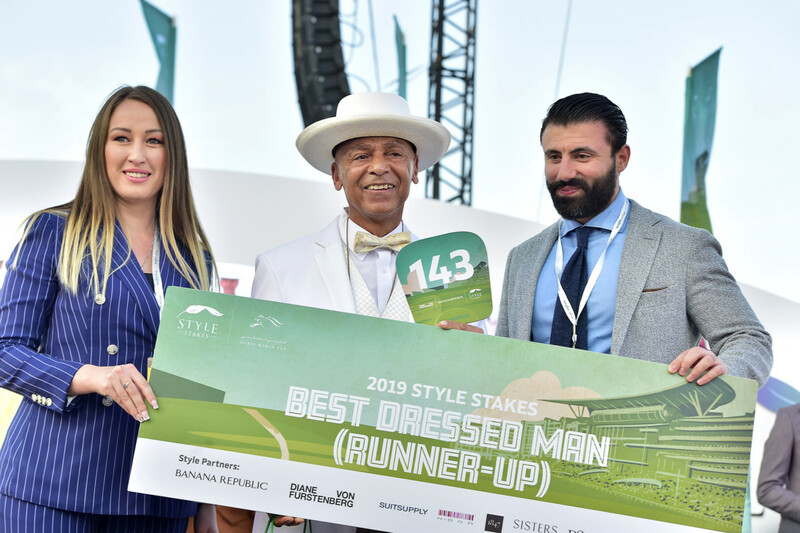 Sudanese fashion designer Nader Tearab won the Best Dressed Man prize three times before. 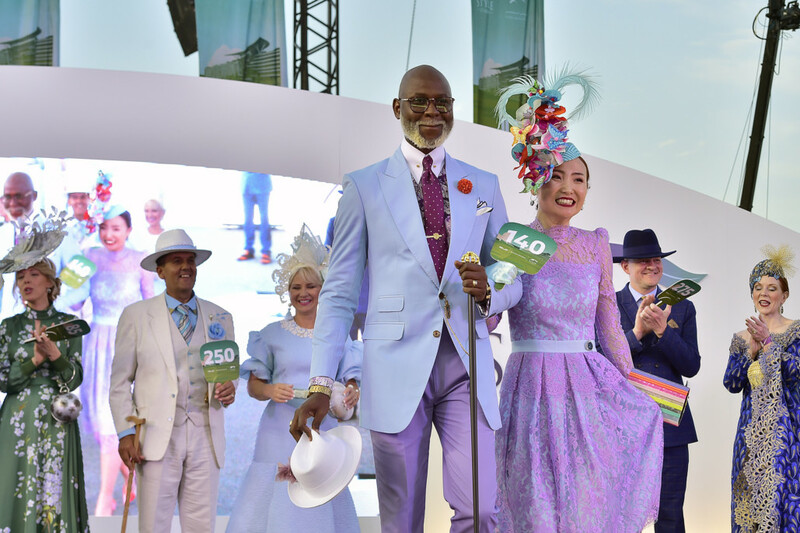 But his latest Style Stakes achievement may be even sweeter — it marked his first Best Dressed Couple win with wife Yao Zhengqi, from China. “We met in 2011 — I worked in a hotel and she joined the hotel, so we got to know each other as colleagues. In 2015, we got married,” said Tearab. 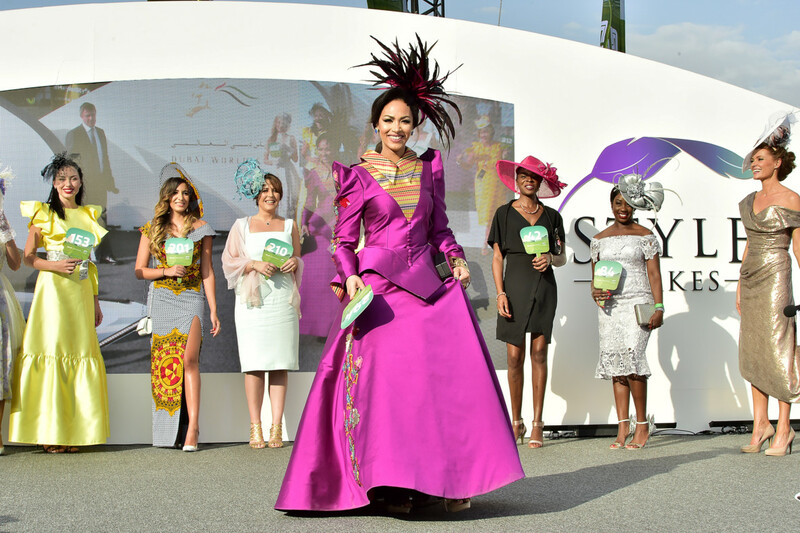 Tearab, who has a sharp eye for colour and fabrics, designed his wife’s dress himself. It took two months from concept to completion. 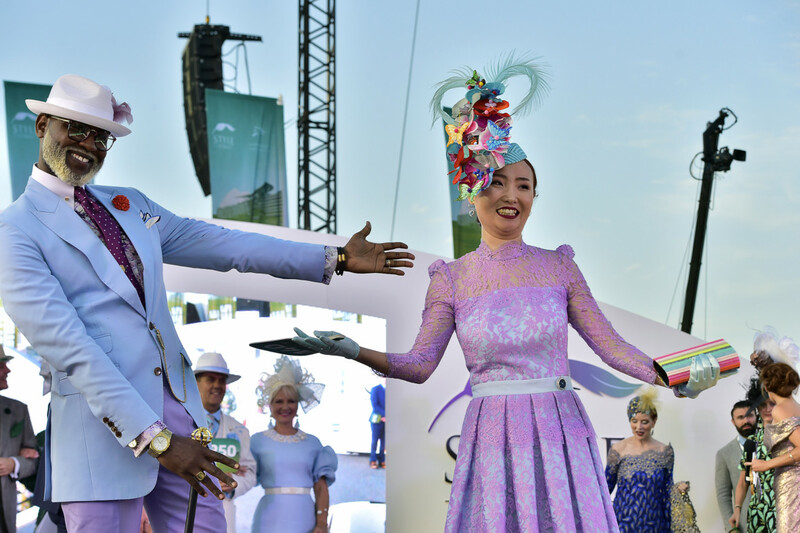 The lavender lace and light blue lining were inspired by spring, and Tearab modelled his own suit after Zhengqi’s outfit. “This is the first time I designed a dress. I usually design suits for men,” said Tearab. 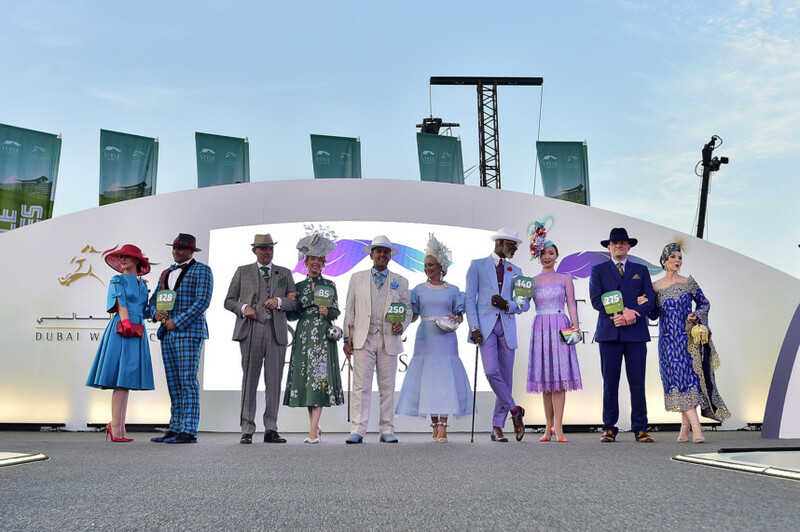 The couple contemplated bringing their four-month-old son along to watch mummy and daddy compete, but decided against it for now. Soon enough, he might be a fierce competitor himself. “He’s too young to come — but next year, he might come with a bow tie,” said Zhengqi. 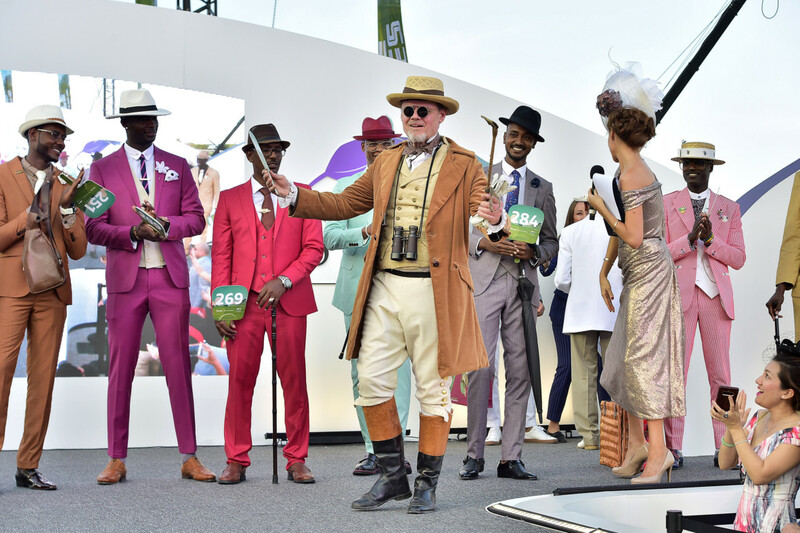 All winners walked away with prizes, including but not limited to brunch packages and Banana Republic gift vouchers ranging from Dh2,000-Dh10,000 in value. Spa vouchers were awarded to the women and grooming vouchers to the men. 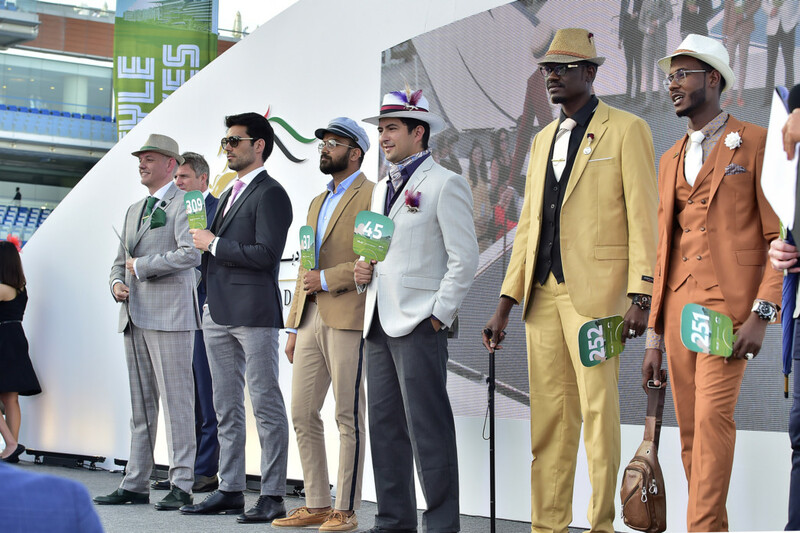 In addition, Suit Supply vouchers were awarded to the Best Dressed Man and the Runner-Up, while Diane Von Furstenberg vouchers were given to Best Hat and Most Creative Hat winners.